How many of these tricky tech brand names have you been saying wrong? You might be surprised. Sometimes it's the result of a lost-in-translation effect -- a tech brand that might have worked in the company's native country but doesn't quite make sense to our English-tuned brains. Other times, it's the result of a silly name that'd seem strange no matter where you saw it. So how many names have you been saying wrong? Time to find out. 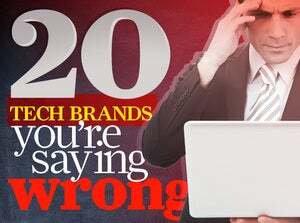 Here are 20 of the most confusing tech brands -- and how they're meant to be said. This Chinese phone-maker may take the cake for most butchered name in technology. In fact, so many people are baffled by the brand that the company actually thought about changing it for the American market -- despite having a well-established reputation elsewhere in the world. Counter to popular belief, Huawei isn't "HOO-uh-way" or "wuh-WEE." It's "WAH-way." Most Americans first heard of Xiaomi when tech celeb Hugo Barra -- who'd been a Google VP in charge of Android product management -- announced he was leaving Google to join its ranks last year. And most Americans have been struggling to say the company's name ever since. The mystery ends here: According to Barra, the best way to pronounce Xiaomi is to "think of 'show me' and then pronounce the first word as if it [were] 'shower.'" Technically, the first syllable is more "SHIAO" than "SHOW," but the difference is fairly subtle to most American ears. If you've ever used a phone or tablet with wireless charging, odds are you've used Qi -- the most prominent wireless charging standard. But you may not have realized you were using "chee," not "kee" or "kyoo-EYE." The reason? The name Qi comes from the Chinese word for energy flow. And -- you guessed it -- that word is pronounced "chee." Qi may be the current wireless charging norm, but some tech companies are hoping a different standard called Rezence will soon take its place. Rezence is based on the words "resonant" and "essence" -- insert sarcastic-sounding sigh here -- and consequently, its creators have decided the name is pronounced "REH-zence." Ruh-roh. Good luck getting the world to say that one right. You could talk to 20 different tech enthusiasts, and each one of 'em would say Asus in a slightly different way. In fact, even Asus itself seems to have shifted its official pronunciation around a few times over the years. Now that it's owned by Google, Zagat is technically a tech company -- and that means we techies join the ranks of millions who have no idea how to say its name correctly. Here's all you need to know: "zuh-GAT," not "ZAH-get." Kind of like someone with a thick German accent saying "the cat." Samsung's got Galaxy, HTC's got One -- and Casio, bless its confused little heart, has the g'zOne line of Android phones. It may look like a text-based approximation of the sound of a sneeze, but the strangely spelled and punctuated g'zOne is, in fact, a gadget. So how the hell do you say it? "GIZ-own"? "GEE-ZEE-wun"? "GEE-zone"? "guh-zuh-OWN"? I think I liked it better when I didn't know how it was said. If you read much tech news, you've probably found yourself on the pages of the online publication Gigaom at some point. And you've probably wondered what its name is all about. Well, wonder no more: Gigaom is pronounced "gig-uh-OHM," with the last syllable rhyming with "foam." It's named for its founder, Om Malik, an author and former Forbes writer. A tech insider favorite, Techmeme aggregates trending technology headlines from across the Web. But even with "meme" becoming a more mainstream word, lots of people look at it and scratch their heads. A meme, according to Merriam-Webster, is "an idea, behavior, style, or usage that spreads from person to person within a culture." And it's pronounced "meem" -- not "mee-mee." One of tech's most famous venture capital firms is also one of the most frequently mispronounced. So let's set the record straight: It's "an-DREE-sen HOR-uh-wits," named after founders Marc Andreessen (a.k.a. the hard-to-pronounce guy) and Ben Horowitz (a.k.a. the other chum). Say it with me: "an-DREE-sen." "an-DREE-sen." "an-DREE-sen."
This one seems simple, but hang on: If you say it "no-KEE-uh" or "NO-kyuh," you might not be getting it right. At least, not by the company's own standards. There's quite a bit of divergence on this one, but according to Nokia's official YouTube videos, Nokia is said "NAW-kee-ya." Who knew? Quick: How do you say McAfee? If you said "MAC-uh-fee," congratulations: You're spot on. (I'll also accept the pronunciation "CRAY-zee dood.") The more common pronunciation of "mick-AAH-fee," however, is as wrong as the company's founder is nutzo. The good news: You won't have to say the name much longer. Intel recently announced it's shedding the McAfee moniker and rebranding the software -- which it's owned since 2010 -- to Intel Security. The original name for Sony's music streaming service was supposed to be said like the word "curiosity." Riiiight. I think it was more commonly pronounced as "that dumb Q word I don't know how to say." Thank qoodness Sony qame to its senses and qicked the name to the qurb. Ativ is one of Samsung's many brands for its multitude of mobile and computer products -- so how is it said? It ain't "uh-TIV" or "AAH-tiv," as many people think; rather, it's "uh-TEEV." Samsung's Exynos chips are scattered throughout the mobile world and avoided daily in conversation by folks who have no idea how their name is pronounced. Fear no more, my friends: Exynos is "EX-in-ohse." I don't know about you, but I certainly feel enlightened. No, that isn't a typo: Pentax actually has a line of cameras called *ist. So is it "star-ist"? "asterisk-ist"? Just a series of guttural clicking sounds? Nope -- the general consensus is that the symbol itself is silent and the name is simply said "ist." If you ask me, that sounds like a crock of **it. Ainovo is a brand of low-cost Android tablets made by a Chinese company called Ainol. Thankfully, the "ai" is pronounced like the letter "I," not the letter "A." Close call there, Ainol. Close call. This aftermarket firmware for Android is hands-down one of the most confusing brand names I've ever encountered. You might think it's just pronounced as initials -- "emm-eye-yoo-eye" -- but nay: MIUI is evidently said "MEE-yoo-eye." Think Samsung's phone names are silly now? A few years back, the company actually released a device called :). The phone was pronounced "smiley." Unfortunately, its successor :O~~ -- pronounced "vomit" -- never made it to market. With a name like Cius, is it any wonder Cisco's business-centric tablet didn't survive? Almost every article I've found on the Cius finds it necessary to include a parenthetical pronunciation guide for the product. FYI, it's "SEE-us." As in, "Now you see-us, now you don't." Author JR Raphael has a deceptively difficult last name (hint: It isn't pronounced like the ninja turtle). You can find him on Google+, Twitter, or Facebook.